A Vero Beach man tells the Space Coast Credit Union that he was being held hostage for money. Photo by Indian River County Sheriff's Office. 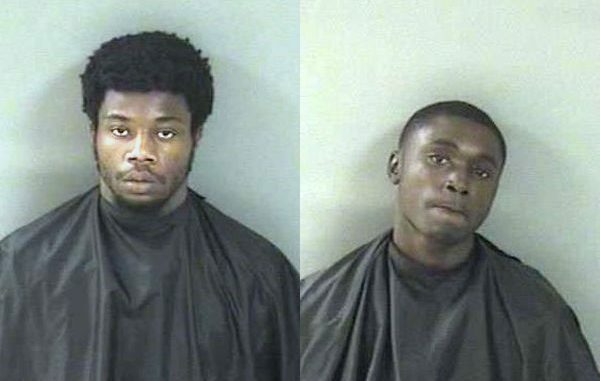 VERO BEACH – Two men were arrested Wednesday after they allegedly kidnapped a Vero Beach man and drove him to the Space Coast Credit Union where they demanded $1,000, according to the Indian River County Sheriff’s Office. A man walked into the Space Coast Credit Union in Vero Beach and told bank employees he was abducted by two men who are were sitting in his pickup truck in the parking lot. Employees notified law enforcement as the man began crying and shaking from the alleged kidnapping. Deputies arrived and detained the two suspects, identified as 20-year-old De’Vonte Alfred Davis and 18-year-old Keonte Terell Davis. The victim told deputies that he had a relapse the night before and he was smoking cocaine, and handing out money on the streets near Fort Pierce. At around 5:00 a.m., the two men demanded $80.00 for being on their street. The victim said he became fearful as they entered his truck. One of the subjects climbed into the driver’s seat and began driving the victim around Vero Beach, the report said. When they went to an ATM, the victim realized that his debit card was frozen because of all the unusual transactions from the night before. The men told the victim that he was not free to leave until he gave them $80.00, according to the report. A few hours passed, and the victim said he would take them to his bank to get the money. The two men then wanted $1,000.00 for the “inconvenience of driving” the victim around town, according to the arrest affidavit. “It was made clear to me by [the victim] that he was not allowed to leave until he paid the money to the suspects,” the deputy said. Bank employees said the victim walked in with tears in his eyes and stated he was being held hostage and needed $1,000.00 to give the two men. Employees then told the victim to go into the men’s bathroom and lock the door while they called the police. De’Vonte Alfred Davis was charged with Felony Kidnapping, Felony Possession of MDMA/Ecstasy, and Marijuana Possession. Bond set at $106,000.00. Keonte Terell Davis, the driver, was charged with Felony Kidnapping, Felony Cocaine Possession, Felony Possession of MDMA/Ecstasy, and Felony Grand Theft Auto. Bond set at $135,000.00.